I love this. I dare you to watch it and not get warm and fuzzy. I’ve had friends that watched this video and said that they wanted to fly across the world, just to lose something so that it could be found by this dog. A few weeks ago I was returning a car and was on the other side of town near a Starbucks. I had just enough cash on me to buy my wife a Pumpkin Spice Latte (or #PSL if you’re in the know). I had actually ticked my wife off earlier in the day and I thought this would win me some brownie points. We had no coffee in our house and the new PSL’s had only been back at Starbucks for a few days. I was about to be a hero. I drove all the way home and walked in the door carrying the magic Starbucks cup like I had just won a war and this was the spoils of my victory. I was proud of how awesome I was as a husband. I am so thoughtful, considerate and… well, let’s say just overall amazing. Then she took a drink. Coffee. With Cream. My wife doesn’t drink coffee with cream from Starbucks. And I don’t pay $5 for stuff my wife or I don’t drink. That would be like buying tickets to a movie you don’t want to watch. So she drank it. Because she’s awesome and I’m not. 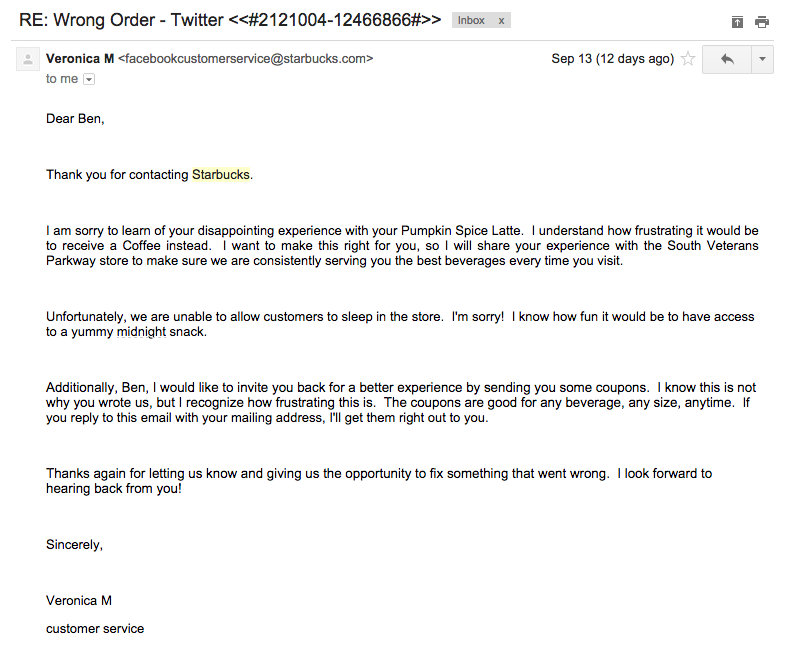 I thought, “how am I going to make the most out of this?” I’ll probably write a tweet to see how Starbucks responds…. and it’ll probably turn into a blog post (and here we are). Just a few days later I had a very nice letter addressed to my home that included two drink coupons for any drink, any size, at any location. Hopefully if I had an actual concern (other than just a wrong order), they would have shared it with the local store so they could address it (that’s another blog post for later). The result? I’m still a happy Starbucks customer. They impressed me with their customer service. You should also note that, as the customer, I didn’t have to work hard to for this to be corrected. They didn’t ask for proof of purchase (a receipt or picture of the cup), they didn’t ask me to take it back to my local store, etc. They just gave their customer the benefit of the doubt and made it right… in fact, by sending me two drink coupons they MORE than made it right. So how are you wowing your clients with customer service? How are you monitoring for satisfaction? What are you doing to remove any ill-feelings about your company or your service? First, start listening to your clients… then, respond! They’ll appreciate you even more! 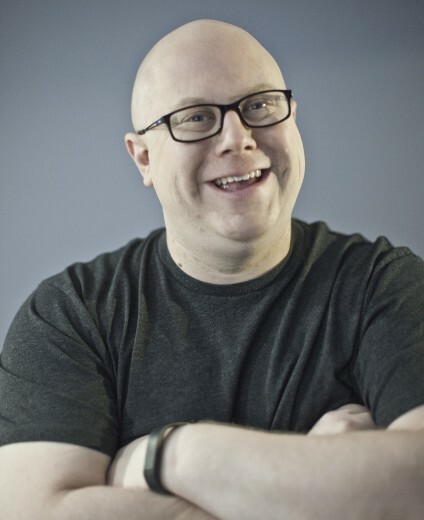 4 Responses to How are you “wowing” your customers with service? 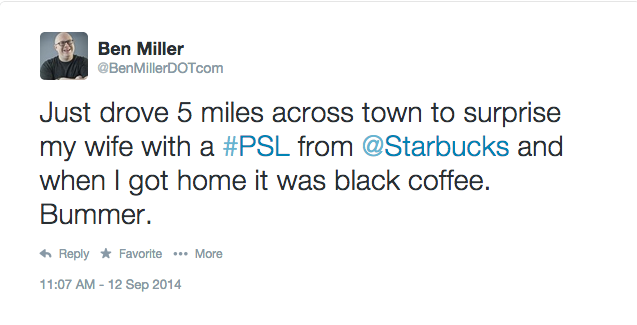 Yep, I’ve experienced great service from Starbucks, as well. I bought a travel French press mug from them, and over time the screen filter began to wear out, and my coffee started getting chunkier with bits of grounds mixed in. I called to ask where I could purchase a new filter, but they said they didn’t sell those separately. So, they ended up sending me a free replacement mug! And like your story, they didn’t ask for a receipt or proof of purchase or anything! I may go to Starbucks today… just because they’re awesome. Oh, and it’s Fall, so every day is a Starbucks day. That’s so cool! Thanks for taking care of me! Keep up the great work!